Jane Blundell has come to Seattle to teach some workshops. Having interacted with her on social media, I offered to pick her up at SeaTac and take her sketching for the afternoon. 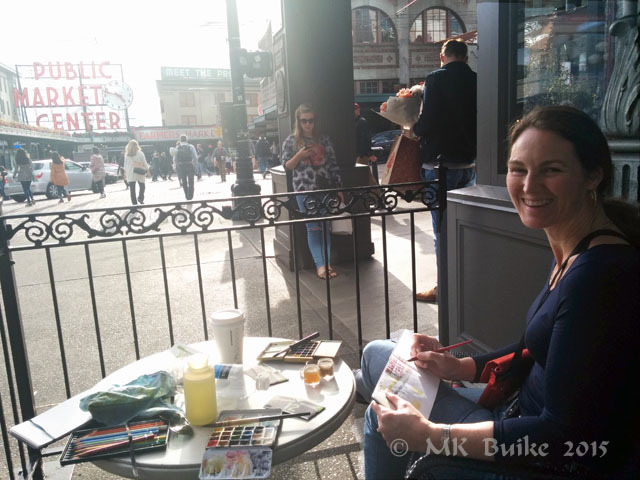 Among Urban Sketchers, she's known as the guru of paint mixing! She has a demo and two workshops at Daniel Smith Seattle. If you can't make those, she also has a Gallery Show there. I came with 3 or 4 suggestions and she thought she'd like to see downtown Seattle. We went to the iconic Pike Market. 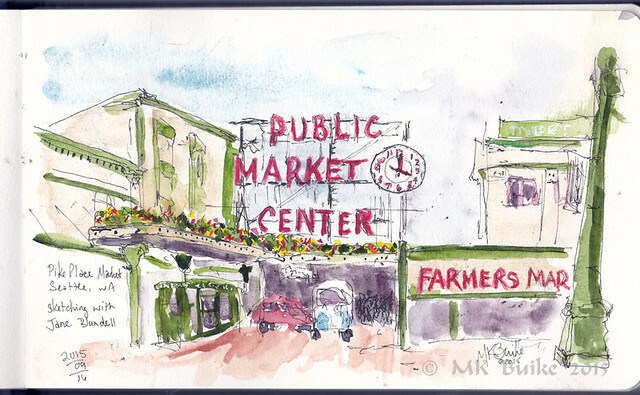 After wandering the market for awhile, we settled down to sketch the usual view of the Public Market sign. We sat on a busker's spot. They're indicated by a musical note and a number painted on the sidewalk. Since it was already about 1530, I thought we'd be safe. Just as we got some of the drawing done, sure enough, the young buskers showed up. They were quite nice, only asking if they could play next to us. However, when I asked, they said, "yes" it was there spot. So we moved. Turned out to be a fortuitous move. We found a table at the coffee shop across the street that had a good view of the market. Lots of people blocking the view though, so patience was required. But a much more comfortable sketching spot. That's how for the first time ever I sketched this Seattle icon. I'd never attempted it before.... I was always too intimidated by the subject and also too cold, too hot, too crowded. This was the Goldilocks spot!